I had a freelance story in my old stomping ground of the Chronicle business section today — a Q&A with Noah Alper, the former owner of Noah’s Bagels. When I was covering small business for the Chron, I received review copies of about a zillion (give or take a few million) how-to books about entrepreneurship. They all pretty much say the same things, and none of it is rocket science. Likewise, the business advice in Alper’s new book, Business Mensch: Timeless Wisdom for Today’s Entrepreneur, isn’t particularly new or earth-shaking, although he takes the unusual step of framing his advice in a context of Jewish ethics and culture. But I enjoyed what he revealed about himself and his life. Not many would-be business gurus write about their failures along with their successes. And I can’t think of one, other than Alper, who writes about being committed to McLean Hospital (the Boston psychiatric hospital) as a young man. That takes some guts. As with most interviews, there wasn’t space in the paper to print the entire conversation. One section that didn’t appear was an exchange about how Noah’s made its bagels during the time Alper ran it. 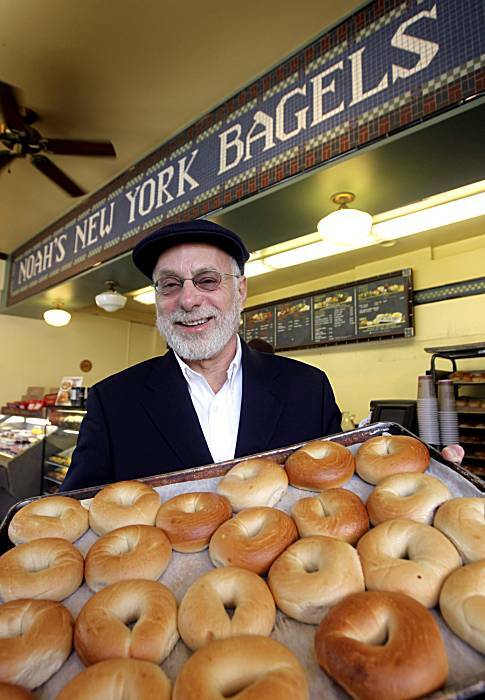 (He sold the company to Einstein Bagel Bros. in 1995). Noah’s catches a lot of flack from purists for not boiling its bagels — for selling bagels that are lighter and breadier than the platonic ideal of the New York bagel. Alper chose the alternate method of steaming bagels – spraying them with water as they go into the oven – rather than boiling and then baking. Personally, I don’t mind the breadier bagels. But what is funny is that three days ago, we got a wonderful Chanukah gift from my parents in New York — a goody box from Zabar’s with smoked salmon and rugelach and bagels. In our household, we all swear by Zabar’s smoked salmon — nobody anywhere in the Bay Area can come remotely close to its melting, buttery texture. They sent us a pound, and it was gone in two days. But the bagels? Direct from the Upper West Side, aka the Old Country? Apparently if you are planning on shipping bagels 3,000 miles across country, you’d better steam them rather than send things that will feel like doorstops by the time they arrive.